The STEVE MADDEN GIVEAWAY ! HOW TO PARTICIPATE IN THE STEVE MADDEN GIVEAWAY? 1. Complete all steps through the Punchtab widget below.Tell us names of the 4 Steve Madden pairs in the blog post or on my Facebook page along with your email id. 2.You can participate on my Facebook Page. 3.You can participate by commenting on this blogpost. 1. To qualify,all steps should be complete . 2. All correct entries qualify for the final round. 3. 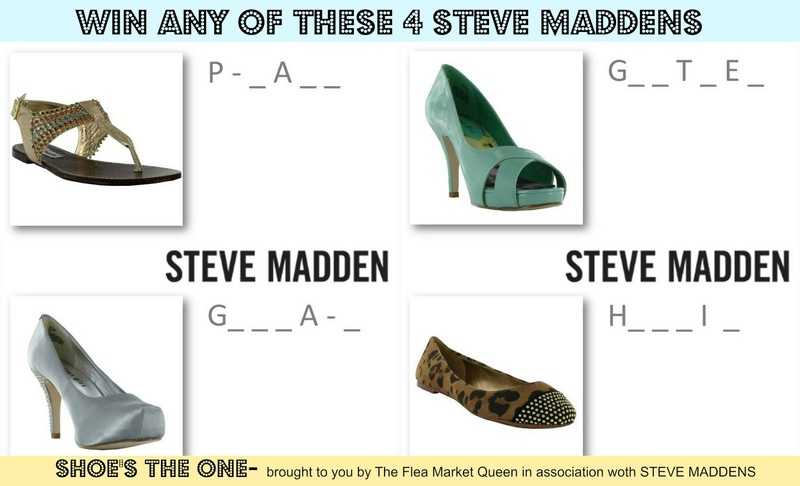 One Lucky Winner gets to choose any one of these 4 featured pairs from STEVE MADDEN. 4.Open to all residents of India. 5. This giveaway is not just for girls.Even men can participate for the ladies ! 1. Like The Flea Market Queen on Facebook. 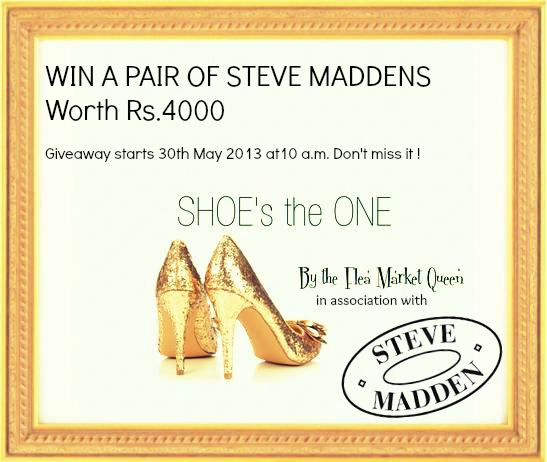 2.Like Steve Madden India on Facebook. 3.Follow @ilawise26 and @SteveMaddenIN on Twitter. 4.Visit Steve Madden Website to find the names of the 4 pairs featured in this post. 5.After completing these steps, tell us the names of these 4 Steve Madden pairs with your email-id on our Facebook page or comment in the blog-post. 6.Tag your friends in the Facebook page Image & share the image on your wall. * You can do steps 1 to 4 through the widget as well! What are you waiting for? Make them yours! Hi ILa, Completed the steps and thanks for hosting a great giveaway ....Steve Madden is my favorite brand!! completed all steps,lovely giveaway..wish to win ! Done all steps, Awesome giveaway.. really wish to win ! hope to win this beautiful footwears. Following on twitter as smile_akank. Would be awesome to win and own a pair through you :) Cheers. In the above answer / comment, depending on whether you count the shoes horizontal or vertical, the serial numbers 2 and 3 could be inter-changed. 2 could be GETTA-S and 3 could be GERTIEE or, 2 could be GERTIEE and 3 could be GETTA-S :) Cheers. HI thnx for the lovely giveaway hope to win.!! Hi....Thnx for hosting this awesome giveaway!!!! Completed all steps! Was already following you and Steve Madden India on Twitter & Facebook! This is a great give-away! I have so many Maddens that I know all on their website by heart now! Thanks a ton for this fabulous giveaway. :) absolutely love all of them ! Hey!! I would love to own all of them, as all the girls wish to do:) Soon!